The orbital period of the Earth around the sun is slightly less than 365.25 days. Those extra digits after the decimal mean that every once in a while, we have to add a day to the calendar in order that make sure that the seasons don't switch every 180 years. Since it's not EXACTLY 365.25, we can't just add a day every 4 years. That would put us too far behind after a few centuries. As a result, we DON'T add the extra day on every 100th year, but we do on the 400th. 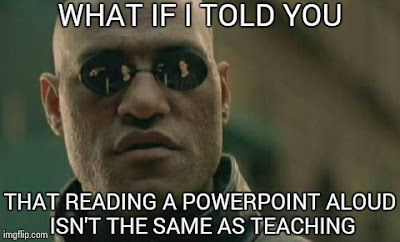 It was a PowerPoint day. I was sitting on tables, and the kids were paying attention and taking notes. While I've had days that I found more exciting, I've also had MUCH worse days. I don't like lecturing much, but it keeps the attention of the kids more than assigning them a task and saying "go." You're not the boss of me, Morpheus! In Physics, we briefly went over the first part of the test that they took on Friday. The majority of the students did VERY well and I was pleased. The take-home portion was another matter. The questions were a bit more difficult and required them to branch out a bit. I made myself available (through email) this weekend for students who had questions and only one took advantage. I'm curious to see how they turn out. I'm going to go read to children now.